We all know that corn is one of the things the great state of Indiana is known for. 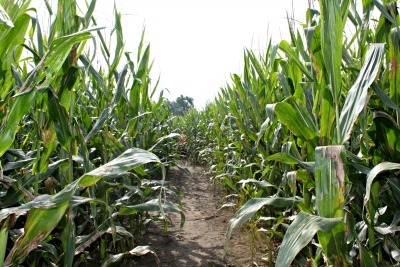 What you might not know is that fall in Indiana brings one of my favorite things: Corn mazes! This past weekend, my family traveled to Beasley&apos;s Orchard in Danville to check out this year&apos;s a-MAZE-ing maze. 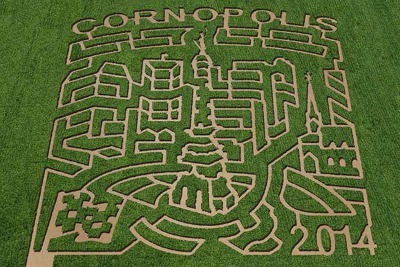 The theme of this year&apos;s maze is "Cornopolis," with a design based on the city of Indianapolis. Looking at the design you can see Monument Circle, a checkered flag and Christ&apos;s Church Cathedral. Cornopolis features over four miles of paths to wander, and plenty of twists and turns to keep you guessing! Instead of using a map to find your way through the maze, Cornopolis is navigated using a passport. There are markers placed throughout the maze, numbered 1 through 10. Each time you come to a number, check your passport! You&apos;ll have a question to answer, and if you&apos;re correct, you&apos;ll get a hint about which way to turn next. Our family was able to find all of the markers in order...but we did visit a few more than once! The passports come in a variety of themes, so you can answer questions about corn, Halloween, Scouting and more. Beasley&apos;s Cornopolis maze is a great activity for families, but there are a few things to keep in mind as you plan your visit. The maze can be navigated in about 30 minutes, but our family took a little over an hour. The walk may be a bit long for young children, so be prepared to carry them if they get tired. The ground was soft and a little muddy the day we visited, so I recommend wearing closed-toe shoes that you don&apos;t mind getting a little dirty. But my biggest tip is to be sure to visit the Beasley&apos;s Market inside their beautifully decorated Civil War-era barn after you&apos;re done making your way through the maze! Get a bag of apples to take home, some cider or a hand-dipped caramel apple. Beasley&apos;s is also a great place to pick up your Halloween pumpkins. 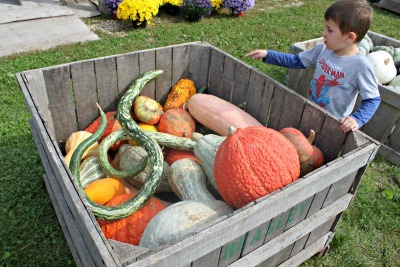 My boys loved checking out the unique and unusual fall gourds! Every weekend in October, Beasley&apos;s will also have hayrides to the pumpkin patch, a giant hay mountain for kids to climb and many more family activities. Don&apos;t miss your chance to experience this great autumn tradition! Where: Beasley&apos;s Orchard, 2304 E. Main St., Danville. When: 10 a.m. to 5 p.m. on Fridays and Saturdays and noon to 5 p.m. Sundays through Oct. 31. Cost: $8 for ages 12 and up, $6 for ages 3-11 and free for kids under 3.